Welcome to the GPUSimPow webpage! GPUSimPow is a detailed, architecture-level power simulation framework for the compute part of contemporary GPUs such as NVIDIAs Kepler or AMDs GCN designs running CUDA or OpenCL workloads. 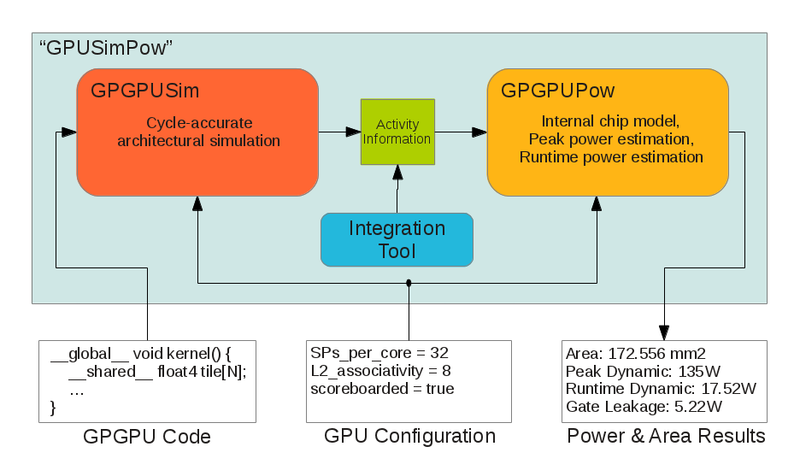 With this simulator, computer architects and CUDA/OpenCL developers can dissect and analyze GPU power consumption down to individual hardware structures on the chip. The most recent version of the simulator can be downloaded here as a tarball. Instructions how to install and use the simulator are included in the package. If you are using GPUSimPow in your work or research, please cite our 2013 ISPASS paper "Why a Single Chip is Causing Massive Power Bills - GPUSimPow: A GPGPU Power Simulator" from Jan Lucas, Sohan Lal, Michael Andersch, Mauricio Alvarez-Mesa and Ben Juurlink. If you have any questions regarding the simulator, please write a mail to our secretary. GPUSimPow is developed by the AES LPGPU team under the lead of Prof. Ben Juurlink. This project receives funding from the European Community’s Seventh Framework Programme [FP7/2007-2013] under the LPGPU Project (www.lpgpu.org), grant agreement n°288653. LDSTU now operates on half-warps, but at double clock freq.